Ripley’s Believe it or Not London is a great place to visit for a family day out in London that’s definitely out of the ordinary. Over 6 floors and 700 amazing artefacts of everything you can imagine (and some you can’t). Located at 1 Piccadilly Circus and is open 365 days of the year from 10 am-midnight. We had previously visited in 2015 for Alice’s adventures in Wonderland at Ripley’s so were curious as to what has remained the same and what is different. If you have never been to Ripley’s Believe it or Not London then give yourself plenty of time to get around because there’s just so much to see, do and absorbed. Even though we had been before we still found new things to discover. Whilst there is plenty to entertain be aware that it may not be suitable for those with sensory and mobility problems. As our son is a Sensory Seeker he loved all the different lights, colours and visually appealing artefacts – as well as the hands on activities for him to do. After our lunch we took a trip to #RipleysBelieveitornot was interesting to see what has changed in the last 2 years and what has remained the same. I think a Sunday afternoon was a perfect time to visit as it was so quiet. Either that or this guy scared everyone away! 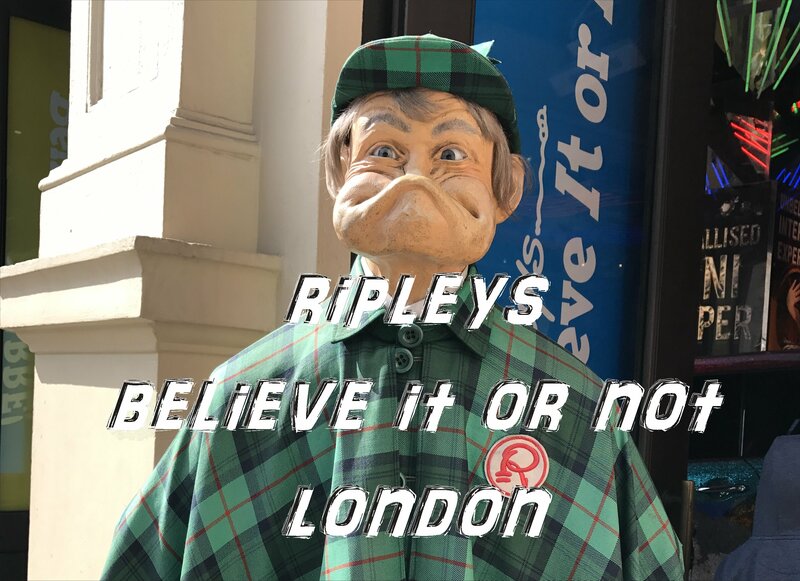 Ripley’s Believe it or Not London 2017 – I guess the main thing to note is that since our visit in 2015 Alice in Wonderland is no longer there and neither is the Laser race sadly. Plus in the dungeons area the man no longer is electrocuted – he just sits there. The cafeteria has been converted into self-serve machines too. Also you are given gloves to wear in the Mirror Maze, which makes it better as there isn’t dirty marks on the glass (which spoilt the maze as you could more easily see where the mirrors were before). The most interesting new feature I thought was the art work made in Birmingham that is so small it sits on the eye of a needle – you have to view them through a microscope but there is just SO much detail. 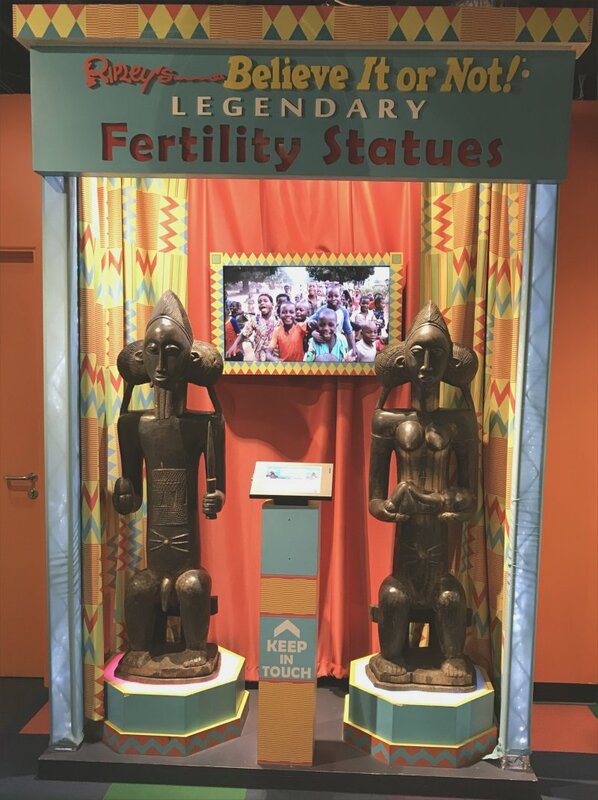 It was the last chance to touch the Legendary Fertility Statues as they leave Ripley’s Believe it or Not London at the end of June. Made from ebony wood and hand-carved by craftsman Baulé tribesman of the West African nation of Cote D’Ivoire in the 1930s they have been credited with helping thousands of happy couples get pregnant. Standing at 1.5 meters tall and weighing over 30 kg each they will then arrive in July at Copenhagen‘s Ripley’s Believe It or Not! We received free entry into Ripley’s Believe it or Not London for a press visit. This sounds like a brilliant day out and definitely something I’d love to take the girls to next time we’re in London, I’ve never been myself and think it would be fascinating.